The film follows Wilee, as in Wile E. Coyote (Gordon-Levitt), as a law student who scraps his books to become a bike messenger in New York. People talk about Wilee being the best rider in the state, known for his speed and tricks he can do on his bike, which has no brakes, gears, or flashy paint. Wilee is sent to Columbia University to receive an envelope of great importance, and deliver it to Chinatown by a certain time. Wilee doesn’t even get on his bike before he is confronted about the envelope by Bobby Monday, a bad, corrupt cop played by Michael Shannon. Monday has a serious gambling debt owed to local mobsters, and when the mobsters try to take it out on him by beating him up, Monday kills one of the enforcers, thus making his situation much more critical. So, why does Monday want this envelope? The envelope contains a marker for $50,000 meant to smuggle a child refugee into the US, but Monday wants it for his personal gain. With the help of Wilee’s girlfriend (Dania Ramirez), Raj, the bike messenger dispatcher (Aasif Mandvi), and other fellow bike messengers; Wilee just might be able to escape Monday and his fellow officers and bad traffic in the heart of NYC to deliver his envelope. 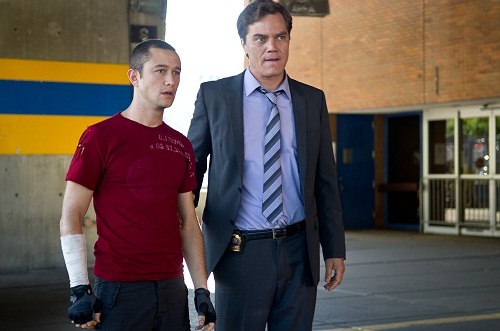 Gordon-Levitt is very charming in this role and completely sells his daredevil of a character. It looks like he did a lot of his own stunts too, as during the end credits, we see an injured Gordon-Levitt laugh off his bloody injury. Michael Shannon was perfect for this role. He plays an over-the-top, bad cop flawlessly, however his character wasn’t given enough screen time or decent story to truly make him a pure evil character. There was just something lacking from the script, not Shannon. And it’s always great to see Mandvi in anything. I always see Koepp as a writer, but when he steps behind the camera, I am always intrigued as I was with ‘Stir of Echoes’ and Secret Window’. ‘Premium Rush’ uses a lot of pauses throughout the film to focus on Wilee’s eyes as he plans and visualizes his narrow routes at intersections to effectively maneuver possible crashes and death. We actually see each choice play out with its outcomes until the sound effect dings and he chooses the safest passage. I was on the edge of my seat during each scene that involved Wilee pedaling at fast speeds, weaving in and out of jam packed traffic. And I loved the use of stuntmen, rather than the use of CG for this film. There are some pretty rough crashes and falls in this film, and each time a character bit the dust, the crowd gasped in pain. Overall, ‘Premium Rush’ is a fun and entertaining film. I don’t think it will be remembered for very long, but it might just be the ultimate bike messenger movie. There just needed to be a little bit more suspense on the overall plot to round things out. It seemed like the only thing that was given any sort of attention to was Gordon-Levitt and the fast paced chase sequences. ‘Premium Rush’ is a hell of a ride, but it’s a one-way ride. 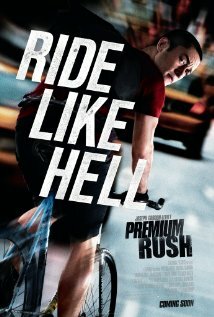 « FedMex’s Review of ‘Premium Rush’!! !